Twenty years ago Friday, the violent world reared its ugly head against Americans when 63 people, including 17 Americans, were killed in the 1983 Beirut embassy bombing. One of them was the Near East Chief of the CIA, Bob Ames. The Early Show national correspondent Jon Frankel reports. At Arlington National Cemetery, there are 1,000 stories worth remembering - but this is Bob Ames' story. "To me, he was a giant. A lot of kids these days have heroes, you know, the basketball stars. Well, my dad was my hero. That's just the way I saw him," says Kevin Ames. Bob Ames grew up in Philadelphia, graduated from La Salle University, did a stint in the Army, then met his wife Yvonne and they raised six children. "I was in fifth grade, and my dad came in for Career Day. So this is the first time I ever heard what he actually did, and what he had told my class was that he had worked with the government in foreign affairs," Kevin Ames says. In fact, Ames worked for the CIA. His daughter Adrienne says, "He had two separate lives. He had the life he did with the CIA and then the life he did at home." For years, "home" was all over the Middle East: Kuwait, Egypt, Iran and Beirut, Lebanon. Fluent in Arabic, Bob Ames grew to know the Arab world -- a region then largely unknown to Americans and even Bob's closest friends. His longtime friend Frank Blatcher recalls a conversation the two had. "What kind of stuff you doing? Stuff for the president. Oh, must be interesting. What kind of stuff? Well recently I met with Khomani. Is that Charlie Humaney? He said, 'No. The Ayatollah.'" George Shultz says, "Here comes this guy from the CIA, Bob Ames. He was extremely helpful and thoughtful." Shultz served as secretary of state under President Reagan, and relied on Bob Ames' insight. How well in-tune was Bob Ames to the pulse of the Arab world in general? "He had a gift," Shultz says. "We look for people who have worked at it and we look for people who can bring us just not information but can bring us understanding." Former CIA director Robert Gates says, "Bob was one of the first to make contacts within the PLO - Yasser Arafat's organization. When he was doing that the PLO was out and out a terrorist organization." Some suggest that Ames' contacts with the PLO helped derail an assassination attempt on Golda Meir, then the prime minister of Israel. In a CBS special report, Dan Rather reported the powerful bomb explosion in Beirut, Lebanon, which ripped apart the U.S. embassy with a number of deaths. A total of 63 people were killed that day, 17 Americans, six CIA agents. The bomb was in a car that crashed through the embassy gates. "And I remember hearing a knock at the door, and then my sister screaming. It's the kind of scream you hear, and you cringe inside, because you know something horrible has happened," Kevin Ames recalls. Bob Ames came home to his family in a flag-draped coffin. President Reagan spoke about it: "With your sorrow you must at the same time feel a pride." The embassy bombing wounded U.S. pride and left a hole in U.S. intelligence of the Arab world. On a personal level, it was clearly a tragic loss. From an information and analytical standpoint, how big a loss was Bob Ames? Shultz says, "He knew the Middle East well -- almost better than anyone that I ran into the government. When he was killed, it was a great sense of loss to everybody." There's no telling if the events of the last 20 years could have been altered. 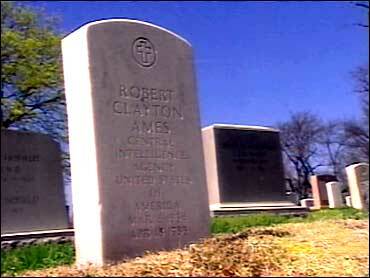 But perhaps if Bob Ames had survived, fewer Americans would lie at Arlington National Cemetery with him. Eventually, the terrorist group Hezbollah claimed responsibility for the attack. Now, more than 20 years later, some victims and their families are suing the Iranian government for $5 billion for financially supporting Hezbollah in the attack.